Stacy Tilton Reviews: Bakery On Main’s Bunches of Crunches - Cereal or Snack? Bakery On Main’s Bunches of Crunches - Cereal or Snack? Some mornings as a mom can be quite hectic. I just don't always have time for a sit down breakfast some days either. Thankfully there are so many different options out there in place of a sit down meal. One of those options is Bakery On Main’s Bunches of Crunches. Yes it can be eaten as a cereal, but it can also be eaten dry too. I love it! If I'm not able to sit down I can pour some into a portable container or even take the resealable bag with me for easy eating on the go! Besides being portable I also like that it's a good for me option. It's not a super sugar coated cereal that leaves me feeling hungry after just a few hours. And because it looks like a chocolate coated food my kids were both quick to check it out too. I was actually quite surprised (and pleased) to find out how much they both liked them. Finally a breakfast food and snack that both of my kids enjoy that's good for them! Score one for this mommy. 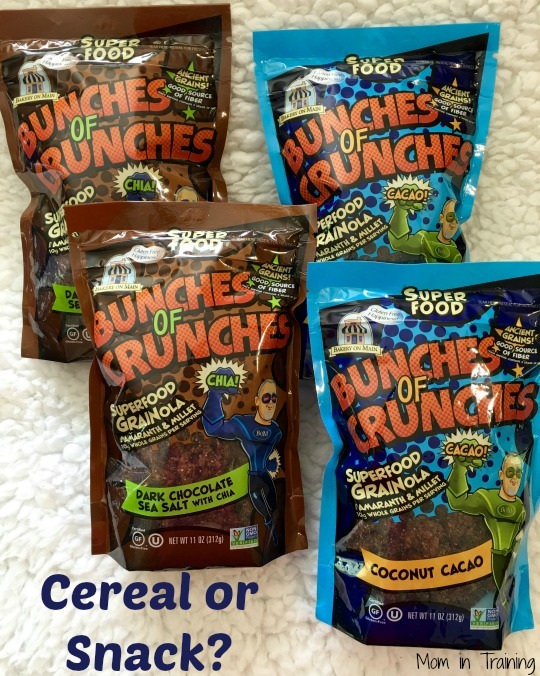 Brought to you by Bakery On Main’s very own “granola superhero,” the Crunch Crusader (Bakery On Main founder Michael Smulders’ alter ego), this new superfood GRAINola cereal is set to save the world from the evils of tasteless gluten-free foods and unhealthy treats. Made in the USA, certified gluten-free, and Non-GMO Project Verified, Bakery On Main’s Bunches of Crunches are also OU Kosher, free of cholesterol, dairy and casein free, and have only 130 calories and 5 grams of fat per serving. These scrumptious chocolate clusters of crunchy goodness are packed with certified gluten-free oats, ancient grains such as amaranth and millet, and superfoods like chia seeds and cacao. They fuel the body with an amazing 10 grams of whole grains per serving! Available in two varieties, Dark Chocolate Sea Salt with Chia and Coconut Cacao, Bakery On Main’s Bunches of Crunches will be sold at natural food retailers across the country this summer and are currently available online at BakeryOnMain.com for an SRP of $6.50 per 11oz bag. I've never heard of this before but it sounds pretty healthy. That is good that they have appealing flavors like dark chocolate.